Welcome to the Faculty of Health Social Care and Education’s research, working in partnership with Kingston University and St George’s, University of London (hereafter referred to as Kingston and St George’s). We are a joint enterprise that combines the research expertise and resources of a modern university with those of a long-standing established medical school in the United Kingdom. We aim to undertake research that makes a difference to health, social care and education services, to the public and to disciplines of nursing, paramedic science, midwifery, rehabilitation sciences, social work, radiography and teaching. We look forward to sharing with you our passion for making a lasting difference to the health, social care and education provision for service users and patients, whether through our research degrees or specialist expertise. The Faculty of Health, Social Care and Education (FHSCE) comprises three academic Schools and a Centre for Health and Social Care Research, together with a Centre for Public Engagement. 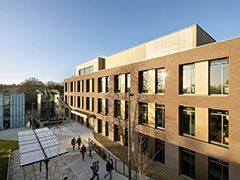 The Faculty is a joint enterprise between Kingston University and St George’s, University of London and as such, combines the research expertise and resources of a modern university with those of an established medical school in the United Kingdom. In the 2014 Research Excellence framework, 74% of our research was judged world leading or internationally excellent. Take the lead and make an impact with our research degrees.